Ken Hanshaw joined Movietone in about 1938, and later became a staff cameraman. Terry Gallacher [qv] recalled that ‘Ken - at one time known as George (until there were too many of them) - joined Movietone as a school leaver’: ‘He had considerable problems establishing himself as a cameraman, but was involved in coverage of bomb and fire damage in London during the war.' Hanshaw’s first surviving credit is for filming bomb damage at Fulham for ‘KILLING THE FLYING BOMB’ in British Movietone News No.786 of June 1944. His next credit is for ‘IN MEMORY OF THE PRESIDENT’ in British Movietone News No.828A of April 1945. After the war Hanshaw was credited for work on the coverage of V.E. Day for ‘VICTORY’ in British Movietone News No.832 of May 1945, and on ‘THANKSGIVING FOR VICTORY’ in No.832A of the same month. He also covered the first postwar Derby, Boat Race, and Ascot, but his regular employment with Movietone seems to have begun with ‘FESTIVAL OF YOUTH’ in No.892A of July 1946. In June 1947 Hanshaw was sent to Palestine to cover the civil disturbances, and his first report was ‘PALESTINE CONTRASTS: POLICE KIDNAPPING’ in British Movietone News No.941A. His last report was ‘GOOD FRIDAY IN JERUSALEM’ in No.982A of March 1948, and according to Gallacher he ‘was frequently in great danger having been captured at various times by both of the belligerents.' Gallacher added that ‘on his return, and for many years, he was frequently used as a contact man, a job for which he was well suited.' In January 1952 Hanshaw filmed the wreck of the ‘Flying Enterprise’ for ‘THE END OF THE FLYING ENTERPRISE’ in British Movietone News No.1180. On this assignment, according to Reg Sutton [qv], Hanshaw spent his time ‘dug in at Exeter Airport making flights over the area and spotting the ‘Flying Enterprise’ twice and in the early hours...he was able to fly back to London with all the negative.' Hanshaw appeared in ‘PRELUDE TO ‘GRAND NATIONAL’' in British Movietone News No.1344 of March 1955, shown with his camera at Aintree. 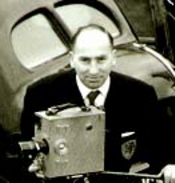 Hanshaw provided hundreds of stories for Movietone, his last credit being for ‘ENGLAND v ITALY’ in No.2320A of November 1973. After leaving Movietone Hanshaw became a freelance, and it is presumably in that capacity that he was credited for ‘ENGLAND V SCOTLAND’ in British Movietone News No.2486 of January 1977. Hanshaw was married to Peggy Noble, the General Office manager at Movietone. BUFVC, T. M. Gallacher, ‘Additional Notes,' October 1998. This record has been viewed 1056 times.